Ever feel like you're in exactly the right place at exactly the right time? Like you were supposed to be there at that precise moment? I had one of those moments today. In the checkout line, I hear a little voice behind me: "He can't have one because he has diabetes, right? Because of his blood sugar?" I turn around, and there is a little girl standing beside a display of lollipops. "Yes," her dad answers, "because of his blood sugar." This family is standing right behind me. Dad, mom, the girl who had spoken, and her little sister and brother. I look at the little boy. I can see the medical ID on his wrist, as he squirms around his dad's legs. He must be the one with diabetes. I've paid for my purchases. It's now or never. I take a deep breath. "Sorry, I couldn't help but overhear your conversation. He has Type 1 Diabetes?" I ask, pointing to the boy. "Me too! I've had it for 20 years." "Oh wow!" she says. "That's so encouraging! We just found out a month ago." "Whoa! So you guys are new at this." She nods. "How old were you when you found out?" "I was 10," I answer. Mom looks at her little boy, and then back at me. "He's two," she states. And my heart breaks. And I want to give them all a giant hug, but I'm afraid that would be too creepy. "She has diabetes like you!" dad is saying to the little guy. "Say hi!" But the little man buries his head in dad's leg. I smile, and he peeks out a bit. Mom nods at her husband, "His job is traveling. So we're on the road all the time. We're learning how to do this on the road." "Yeah, but we're starting to get the hang of it." I look at this mom. Her face is strong and confident. But her eyes are weary and scared. I know that look. I've seen it on my mom's face. On the faces of friends. On my own face. "I know it's hard, but you guys can do this. And there's no reason he can't grow up and be whatever he wants." Mom smiles, "That's what the doctor tells us. But it's nice to meet someone who's had it for a long time." I walk out of the store with the family. The little guy still won't say anything, but now he looks at me. I give him a big smile, and he smiles back. 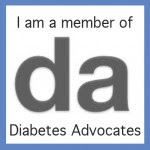 I tell the parents about the Diabetes Online Community, and give them my email address. As we reach our cars, mom says, "It was so nice to meet you." "It was nice to meet you too," I say. "And good luck." They get in their car and go. And I know that I was supposed to be in that store at that moment to meet that family. Exactly the right place at exactly the right time. You seriously have way to many run ins with people with type 1. More so, you are amazing in the fact you choose to talk and not run and hide.